DSM micro-extruder (DSM Research B.V., The Nederland) has 15ml volume capacity, co-rotating twin screw and the temperatures in the six heating zones range from room temperature to 400oC. The extruder can be fit with fibre and tape dies for the direct extrusion of fibres and tapes. The machine has computer telemetry giving data indicative of the viscosity, speed (rpm) and force (N). The Extruder E 20 T of the TEACH-LINE® series are particularly aimed at the field of training and education. In combination with a wide range of modular downstream equipment, plastics processing techniques can be studied on a small scale. Heating is provided by three barrel heating zones, two of which have air cooling and the inlet zone is water cooled. An easily removable hopper simplifies material changeovers and cleaning. Dies are connected using a quick release C-flange which simplifies mounting and de-mounting. The Collin twin-screw kneader is used in development and production of all types of polymer materials, such as thermoplastics, thermosets, elastomers, paints, foodstuffs, doughs and pastes. The control is arranged ergonomically in an operator panel positioned above the extruder. The controller serves for 15 temperature regulation zones, screw speed control, ampere meter or torque measurement, melt temperature and pressure measurement. The injection compression moulding process enables the production of low-stress, thick-walled components without sink marks and with high contour accuracy. The Arburg 221K can be used for making high-quality moulded thermoplastic and thermosetting plastic parts. Using a toggle-lock mechanism, molten plastic is injected into a mould using a 35 tonne clamping force. The machine can be used to produce bottle caps, outdoor furniture and a variety of parts, from the smallest component to entire body panels of cars. 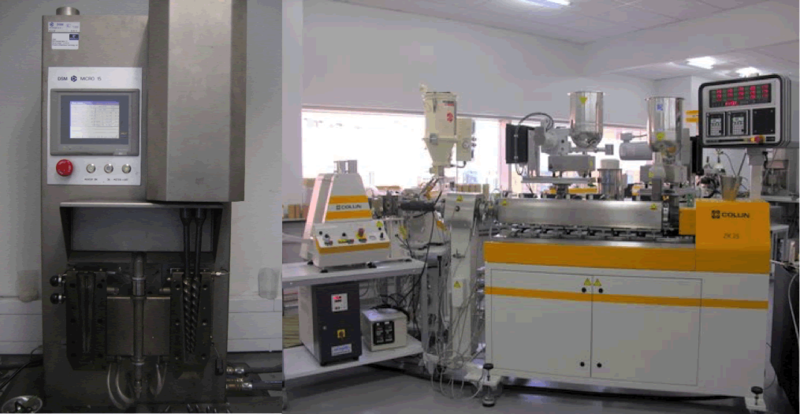 Babyplast 6/10P is one of the smallest, fully hydraulic, injection moulding machines. Thanks to the unique concept of the machine platens which act as mould bolsters, the cost and dimensions of the moulds are reduced considerably. Babyplast 6/10P occupies less than 0,6m2 of floor space and is extremely quiet (< 68dB). This system is ideal for the production of micro parts suitable for all types of thermoplastic materials up to 420°C, metals and ceramic. This system is also suitable to produce multi-layer composites and thin films used by the food industry or the medical field and plastic bags.